Kath and Bill Jillard with daughter Sandra Manning. The couple recently celebrated their 70th anniversary at their regular Sunday haunt, Chocolate Drops cafe in Yanchep National Park. Daughter Sandra Manning said her father lived in a retirement village in Wanneroo, while his wife stayed at a Yanchep nursing home. ‘Every Sunday afternoon he picks her up from the home and takes her to Chocolate Drops,’ she said. Mr Jillard said they also played the game, an online form of Scrabble, every evening and were fairly equally matched. ‘I pick her up at 1 o’clock, take her a dinner that I’ve made, then we go off and have a bit of lunch,’ he said. Originally from the UK, Mr Jillard said they met as teenagers and his offer to pay her one-penny tram fare started a life-long relationship. ‘I was coming home from work when I was 16 on the tram in Birmingham,’ he said. 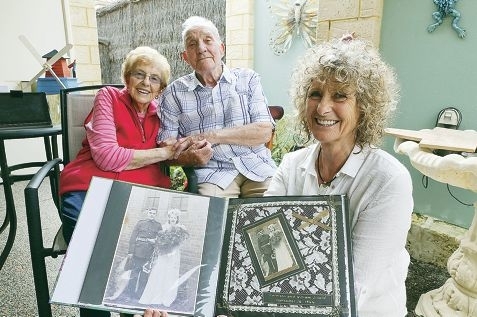 The former corporal spent four years serving with the Royal Marines, mostly in India, and during one trip back to England the couple married on September 16, 1944. ‘Mum was working in England at the time in the war effort; she was in a munitions factory,’ Mrs Manning said. They later lived on a farmhouse in Devon, then moved to Perth in 1980, initially settling in Mullaloo. Mrs Manning said her sister, Judith Andrews, lived in Moora and her parents had seven grandchildren and four great-grandchildren. ‘For their 70th, we had a star named after them ” Jillard 70 ” near the Southern Cross,’ the Gabbadah resident said. Despite his nine decades, Mr Jillard keeps busy at home doing woodwork, and said he often made doll houses, tree houses and windmills to give away. Wanneroo Mayor Tracey Roberts and Chocolate Drops owner Sue Dash joined in the 70th anniversary celebration at the cafe last month. The Jillards also received cards from Queen Elizabeth II, the WA Governor and the Governor General.